This post is by Doris Schuppe of Rayaworx Coworking. At the Coworking Europe Conference in Milan, Rainer from Rayaworx introduced the idea of CoworkingMonday in his session. The feedback was very positive. So we would like to spread the word and invite every coworking space out there to combine our forces to get more visibility for coworking. One thing all of us learned in Milan: knowledge about coworking did not spread that fast and consistently one might think. There is a huge potential of freelancers, knowledge workers, commuters, etc. lacking any experience or familiarity with the new work’s concept. Seeing is believing: We need to attract people to our spaces, and let them feel our community spirits as openness, collaboration, networking, cooperation, knowledge-sharing. Every coworking space around the world uses CoworkingMonday events to promote coworking and to let people experience how coworking is more than just a space to work. The CoworkingMonday is an informal, community-driven event that aims to connect people who are shaping the future of work. Anyone involved in coworking or neighboring fields who is interested in learning and sharing with others is most welcome to join. Whether you are a thinker, builder, designer, trainer, founder or funder – CoworkingMonday is your platform to share your knowledge, to help others with business-relevant advice, or to share your next big idea to a growing audience of coworking aficionados. The CoworkingMonday is organized by coworkers and coworking hosts with speakers / sessions / workshops / networking / … about everything that is related to coworking and the future of work. The CoworkingMonday takes place in a coworking space once a month on a Monday. In a bigger city with lots of coworking spaces it might be a good idea to have a monthly CoworkingMonday each in another of the town’s spaces. In a region like e.g. Southern Bavaria or Mallorca the hosts may think of an additional CoworkingMonday regional event: 6 or 4 times a year the coworking spaces coordinate a CoworkingMonday visiting each other. The organizers feel free to choose the timeframe for their CoworkingMonday: the event might be a breakfast, a morning workshop, a lunch break event (like a lunch & learn meeting or open salad networking), an afternoon session or an evening function – it’s up to you! A global directory will list all CoworkingMonday activities worldwide. The global hashtag #CoworkingMonday combines all activities and will provide visibility to our efforts. Web Monday is an informal, non-commercial, and completely community-driven event that aims to connect the people who are shaping the future of the internet. Inspired by the culture of Silicon Valley, it started out in Cologne, Germany in late 2005 in an effort to help spread those sunny California vibes. Since its inception, Web Monday has spread fast: meetings are now being held on a regular basis in 40+ cities all across Germany, Austria, in Switzerland, Sweden as well as in the Silicon Valley. Nurturing the local web 2.0 and internet startup scenes, Web Monday’s 100+ meetings have attracted 1,000+ repeat participants so far, and good things have come out of it. CoworkingMonday – when do you start? Are you in? Give us a shoutout via comment or even better by sharing this blog post with the hashtag #CoworkingMonday. Or plan the first CoworkingMonday event in your space? Let us know! Hub Vilnius joined over 30 other coworking centers from across Europe for the first coworking Jelly week. Come to Hub Vilnius on the 21st of January for Jelly there. Jellies are occasional meetings at which a small group of people come together to collaborate in an informal atmosphere. Unlike coworking spaces, no membership is required, they cost nothing and take place in a variety of locations. They offer the opportunity to exchange ideas, with no commitments or costs. And at the same time, they allow a community to build that can eventually lead to the development of an institution like a coworking space. With these two benefits in mind, Anni Roolf, a communication designer from Wuppertal, has organized the first European Jelly Week. It will take place from January 17 to 23 in many cities across Europe. The name “jelly” was chosen by a group in New York in 2006, taking inspiration from jelly beans. In the end it is simply a fun name, one which is yet to surface in Wikipedia. “These meetings are probably too unstructured and not organized enough for it. Many meetings in spontaneous locations could qualify as a jelly. But even so, somebody could have written an article about it on Wikipedia. The concept has existed now for five years, after all,” Anni said. As well as the first Jelly Week, Anni has also initiated the development of the first coworking space in her home town. Jelly meetings can act as a temporary coworking meeting, even if no fixed premises have yet been found. It also helps spread the coworking movement to new places. Another reason is to help spread the word about the coworking movment and foster a pan-European dimension to encourage international exchanges and attract more media attention. How each Jelly looks and functions is entirely up to the creativity and knowledge of each individual organiser. “We only create the basis, and it is up to the people to visualize what they can make from it.” For herself, Anni hopes to develop the initiative for a coworking space in Wuppertal, and to network with people in other locations. So far, 30 organizations from 14 countries have signed up to host meetings, many of them coworking spaces. A central site will help all participating jelly meetings communicate with each other, as well as a Twitter wall using the hashtag #jellyweek. Jelly Week offers a good opportunity for the strengthening of the European coworking community. To participate, simply contact Anni. 8 (easy!) 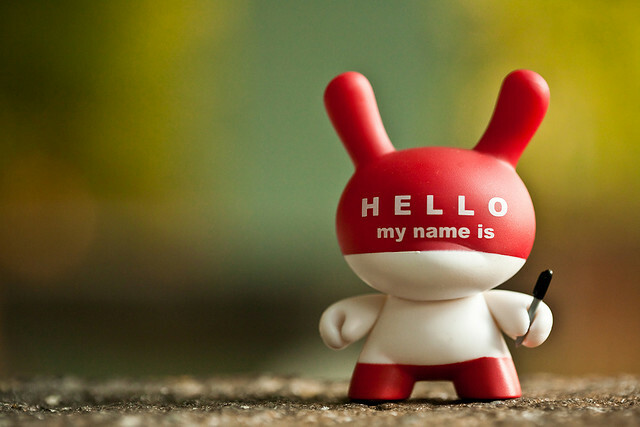 steps for creating a local meet-up group for other freelancers and small business owners. Host a local meet-up group--it's easy! Coworking naturally creates community—it’s the beauty of freelancers and independents working together in a shared office space. No doubt you’ve benefited from this coworking community goodness. But have you ever thought about having a group that is more focused on a niche you’re interested in? Here are 8 easy steps for how to create a local meet-up group for other freelancers and small business owners. 1. Choose a topic & purpose. 2. Ask two people to join you. “Two?! Only two people? !” you shriek. Settle down. Ask two people who would fit the niche meet-up group to help you. For example, two other programmers if it’s for a programming group, or two other freelancers interested in non-profit organizations. Not only will having two other minds make choosing a time and venue easier, it will help diversify and grow the meet-up. And even if it’s just the three of you that end up attending the first meet-up, three people can do a lot of brainstorming and sharing. Check to ensure that your meet-up idea isn’t already happening somewhere in your area. If a similar group exists—great! Offer to join forces. If not, make sure your meet-up doesn’t conflict with other events in the area. Will the event be weekly, monthly or bimonthly? Will attendees likely have availability before, during or after work hours, or perhaps on the weekend? Coffee shops, restaurants with private rooms and local community centers are a great place to find free or low-cost space for your group. But y’know what would be even better? Ask your coworking space if you can use the space during an off-time (evenings or weekends). 5. Set up an online event. 6. Share the event with your network. Post information about the meetup at your coworking space. Tell your friends on Facebook and your followers on Twitter. Talk about it on your blog. Announce it at other events you attend (but only if it’s relevant!). Share with your professional groups. Send an email to friends, former colleagues and anyone else in your network that seems like a perfect fit for the meet-up (especially if it’s someone that might not use Facebook or Twitter very often). If the meet-up group is hosted at your coworking space, do you want to provide snacks or refreshments? Or perhaps you’ll need a whiteboard & markers, a giant brainstorming notepad, or a laptop for taking notes and looking up websites. An LCD project and screen? Nametags and markers? Think again about the topic and purpose of the meet-up group, and ensure you have all the materials and “little things” needed to make it a great event. The meet-up group you’ve helped create should be fun, information-rich and valuable for everyone involved. Enjoy it! Have you ever started a local meet-group? What worked and what didn’t? Tell us below in the comments! On coworking sustainability, urban workstyles and business model. I’d like to share these views on coworking, with this presentation to be held in Florence, Italy, on Oct. 15th @Festival della Creatività. Cowo® is the network of 21 spaces (and counting!) that is spreading around in the country since February 2009. In particular, what I’d like to discuss is the “business sustainable” model we are trying to leverage, keeping break-even point to zero by exploiting existing spaces. In other words, we are working on the consideration that opening cw spaces inside existing offices and keeping it very basic is a 100% revenue activity. Thank you in advance for your attention and comments! Author Massimo CarraroPosted on October 14, 2009 March 14, 2016 Categories Coworking, Elsewhere, Events, Getting involved, Ideas, Local efforts, Of interest, Spaces3 Comments on On coworking sustainability, urban workstyles and business model. 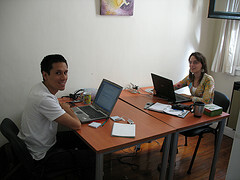 How is coworking doing in Argentina? It’s been a long time since my last post on the blog, so for those of you who don’t know we started Cowork Central back in November 2007, we were the first coworking space in Latin America and it is located in downtown Buenos Aires. Much has happened since our opening almost a year and a half ago and we wanted to share some of those thoughts and plans for the future with you. Many spaces were created in Latin America during this time in the cities of: Sao Paulo (Brazil) and Montevideo (Uruguay), and as I can see from the Wiki right now, a lot more are being planned. This leads me to believe that the coworking movement is actually fitting very well into a very different culture as the northern countries (US, Canada, Europe) have. Although during this time we had the pleasure of being interviewed by very important national and international press (NYTimes, The Globe and Mail, Clarín, El Cronista, La Razón, etc.) we had a somewhat difficult time trying to attract and evangelize local geeks to the coworking idea. Because of this, most of our members are international visitors that are staying for just a couple of months and then move on. On one hand this is actually pretty cool since it adds a lot of cultural value to the space and it’s members but on the other hand it’s not that good in the long term creation of the community. Reaching local individuals has been one of our most challenging tasks. A couple of months ago I had the pleasure to visit some coworking spaces in the US (New York, San Francisco and Austin), had the chance to talk to the founders and members of such spaces and I came back with several ideas to implement here in the end of the world. For the time being we are setting up our very first Jelly event. Again, this would be the first of it’s kind in Latin America. This event is scheduled for June 16th and our idea is that if this goes well, we might start hosting more Jelly’s to attracting more people to the coworking community. Of course, if you happen to visit Buenos Aires, don’t forget to drop by, remember we are participating on the “coworking visa” project. Author FernandoPosted on May 20, 2009 March 14, 2016 Categories Coworking, Events, Jelly, Local efforts, Press, Spaces3 Comments on How is coworking doing in Argentina? Whitespace grand opening in Seattle! What better way to kick off a new milestone in political history than to have a party for the grand opening of a new Coworking space in Seattle! Join myself and my colleagues at Blue Flavor on Friday, November 14th as we launch Whitespace, a coworking space for professionals in Seattle who are passionate about their work, but tired of working alone at home or in noisy coffee shops. Think of it as a co-op artist and tech space. It’s also a great environment for relaxing and collaborating with like-minded people. To RSVP for the event please do so on Upcoming or Facebook. You can also visit RentWhitespace.com to learn more about the space and our rates. Author nickfinckPosted on November 6, 2008 March 14, 2016 Categories Coworking, Events, Local efforts, SpacesTags blue flavor, Coworking, seattle, whitespace2 Comments on Whitespace grand opening in Seattle! It’s Election Day in these United States, and our more-than-five-dozen coworking spaces know it. Some have helped prepare, hosting and organizing open-source crowdsource election-monitoring tools. Others are hosting results-watching parties, offering incentives to visitors who have voted, or simply opening for business today. Williamsburg Coworking, in a Jelly session at the “Change You Want to See” gallery in Brooklyn, New York, hosted a coding party last month, as blogged here, to foster development of the “Vote Report” project mashing up Twitter and Google Maps and creating mobile and web applications to support community-based reporting of election-day problems. They invited other Coworking spaces to be part of a nationwide day of coding parties October 24th. BLANKSPACES in Los Angeles, California is not just hosting a party tonight to watch the returns come in (7-9 PM), it is offering “Free WiFi and a seat at the WorkBar” when you show your “I voted” sticker throughout the day. The People’s Republic of Berkeley Coworking hosted a discussion of the myriad local and state ballot propositions on Sunday. CubeSpace in Portland, Oregon is hosting regular “knitting night” as well as the Ruby Brigade this evening; either could be related to the election or to revolutions in coding, but the connection isn’t obvious. Houston’s Caroline Collective hosted a book-signing Saturday for “One Nation Under Blog,” looking at the intersection of Web 2.0 and politics. The space was slated to host a viewing party for the final Presidential debate, but foul weather intervened. Florida’s second Coworking community, CollabOrlando opened yesterday, in Orlando, Florida. New Work City, which also just opened yesterday, is planning a results-viewing event, although not necessarily in the space (as of last report). Julie Gomoll at Launchpad Coworking in Austin, Texas, while not yet open, has blogged about the connection between the citizen-driven democracy encapsulated in the Obama/Biden campaign and coworking. (she also invited President Obama to come by the space anytime he likes). Seattleites can visit Office Nomads for an election-night viewing party tonight after hours, and bring a cupcake and candle if they like to celebrate the space’s recent first birthday. As I help get out the vote around Philadelphia today, I’ll be stopping by Independents’ Hall to see if anything democracyesque is happening there. What’s your space doing (other than giving paid staff time off to vote, as required by law)? Are your members engaged in the political process? Please add your stories in the comments. Democracy Begins at Work. well, here comes the magic! i hope you can join us this friday, Nov 24 We have an extra special Work at Jelly in store for you at Williamsburg Coworking @ The Change You Want to See Gallery in Brooklyn this Friday! At the typical Jelly, everyone brings their own work to do. For this Jelly, however, we’re inviting you to participate in the first-ever Jelly Jam Session! Geeks, activists and designers from up and down the east coast will convene to build a distributive election monitoring system based on twitter for http://VoteReport.us, and we would love for you to chip in and help! So bring your laptop and something to do, or come by to help build VoteReport! And if you can’t make it to Jelly, please feel free to stop by Williamsburg Coworking’s Happier Hour where we will say good bye to our friend, coworker and fellow jellist, Joshua Heller. If you can’t make it to Brooklyn, feel free to host your own or join us in the IRC freenode channel #VoteReport. Doors open at 9:30am, and the going away party begins at 6pmish. Bring a laptop and tell a friend! * Subway: -L- to Bedford, -J- to Marcy, or -G- to Metropolitan. Did the Mayor declare this coworking week in Oakland or something while I was outta town? East Bay spaces in general and Oakland spaces in particular seem to be proliferating all of a sudden. There’s not just Derby Creek Coworking Cooperative on Telegraph Ave. in North Oakland at the Berkeley border fresh on the scene (where this past Monday’s orientation meeting featuring a Concord coworking space creator and a Berkeley Coworking founder is a topic for another post). It’s much more than the meeting last night at a co-creative incubator-esque social-venture shared space that’s been together since 2003 just two blocks from my home, NextNow Collaboratory. What popped up today on my radar is another new coworking space in Oaktown. BizDevHouse is in the lower Oakland hills/Glenview area, in what looks like a house (a la Cambridge’s BetaHouse) a block off of the neighborhood’s community-oriented commercial strip (Park Street), close to the Montclair neighborhood and MacArthur bus corridor (with frequent 24-hour AC Transit trans-bay service to San Francisco) and 580/13 freeways, one exit up from Grand/Lakeshore business district and Lake Merritt/downtown, near Piedmont and the Parkway Speakeasy theatre with sofas, and also close to the Dimond District and upper Fruitvale neighborhoods. A couple of miles from the BART subway, with a little hill-climbing involved; a similar trek from Berkeley or the downtown Oakland/Oaksterdam, Piedmont, or Rockridge neighborhoods. I’m looking forward to seeing the space and meeting the people behind it. Based on certain clues embedded in the sites linked above, I think I already know some of ’em. We’re entering out second month at GiraffeLabs in the Pioneer Square neighborhood of Seattle. GiraffeLabs is a relaxed space where you can come to work, talk and play. We seek to encourage creativity by surrounding ourselves with creative people. We’re geeks, artists, engineers, makers, musicians, and computer scientists. So come on down and visit with us on thursday evening. I’m sure well be there from around 6 to 8 at least. FYI, we don’t have regular office hours yet.